Very nice rug, bought this a while back and it still looks new. Vacuums easily, nice and thick! 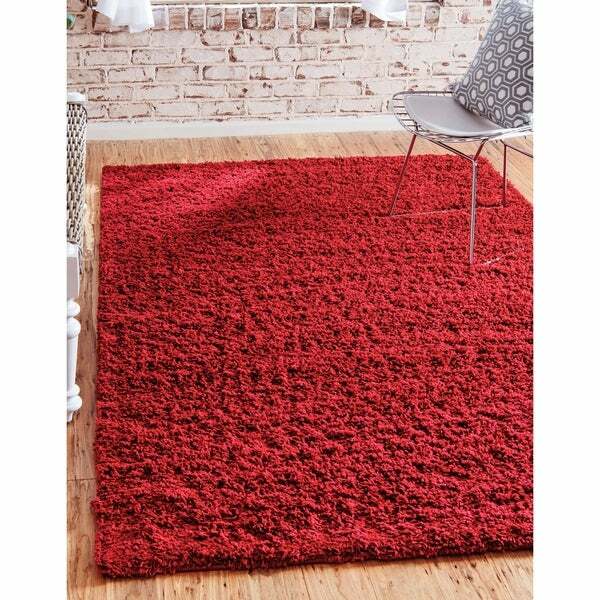 Safavieh California Cozy Plush Red Shag Rug - 5'3" x 7'6"
Our Solid Shag Collection has the capability to brighten any room with a luxurious and lively pop of color. This rug's lush texture adds comfort and style to any room. Choose from a variety of sizes, shapes, and colors to decorate your home and elevate any space. I love the carpet itself. It's soft underfoot and seems very high-quality. I'm glad I bought it and in a large size. But please note that it ISN'T cherry red, tomato red, fire engine red, nor primary red. It's darker -- more of a crimson or scarlet, which makes it a bit hard to accessorize. (See photo for what happens if you put cherry red pillows with it.). However, I like it a lot and have no regrets about having purchased it. I bought this rug to go on a hardwood floor in my living room. It looks and feels great! I recommend a rug pad to go under it to keep it from shifting and add to the plush feel of the shag. I love this rug! It has the perfect thickness and amount of shag! It is easy to vacuum and the eggplant color is just right. I would recommend this area rug to anyone! I got such a great deal for the size! The Unique Loom Solid Shag Area Rug 9' x 12' is beautiful. It is very well made and the bright cherry red color is exactly the same as it displayed online. I am very pleased with my order. I have since ordered a second one in a different color for another room in the home. I was uncertain about making a rug purchase via internet due to the color but was most surprised. The color is perfect being a light vanilla, it matches everything and really brightens up my dining room. The quality of the shag fibers is very good. I would recommend this area rug. Beautiful fun rug! I bought a number of super colorful large area rugs for a recreation center my nonprofit runs. The floors of our building are old and worn. As a nonprofit we don’t have a lot of excess resources so we had the idea to add pops of color with large rugs. I bought a dozen of this colorful rugs and they are so much fun in the space! Love it! This rug came super quick and is really awesome to feel on the feet. I placed a carpet pad underneath for even more comfort. Love the bright color. I would recommend this to anyone who likes deep pile carpeting. Great price! 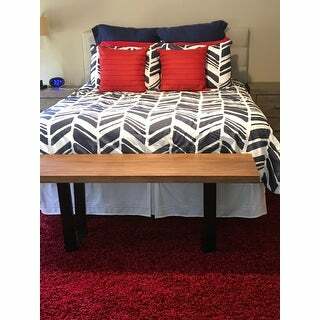 Perfect size for the area and great quality for the price. 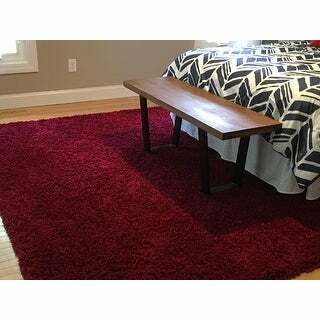 Very happy with the rug and looking to purchase in another color and size for other area in home. Quite nice low shag, beautiful terra-cotta color. Smelled really bad on receipt but with airing and Febreeze it got better. I love this rug. My daughter bought one similar and paid double what I paid. This carpet is horrible! Came smelling strongly of vinegar. It is super thin and not at all soft like others say. I am returning it. Not thrilled with the rug...shag was longer than expected and color was a weird gray...sent back. Try, try again. For the price it was not a bad quality I just needed something with a different look. Not extremely thick pile, but overall a very nice rug. Shorter shag than others I have purchased, but is in a room that needed subtle flooring. I was worried when I ordered it that because of the price (on the cheaper side) that it wouldn't look very good.. and boy was I shocked! Its beautiful (I got the teal one) the color is so rich! Its shag is so soft and thick! Looks perfect in my livingroom! I will be getting another for my downstairs livingroom! Highly recommend.. and the price point is very nice! Nice thick shaggy carpet as advertised. Got here quickly and fills the room nicely. color was just as pictured. it was much lighter than I expected. I will need to get a rug pad to put under it but it's just what we needed in our basement. We searched and searched for the right rug for our den. This rug is fabulous and really pulls the room together. Feels great to walk on and does not shed. Definitely recommend this rug. "Is this rug machine washable? Thank you"
This is not machine washable. This rug is stain resistant and should only be spot cleaned with warm water and a mild detergent. If heavily soiled, it may be steam cleaned by a professional. "How thick is the shag?" The Unique Loom Solid Shag Area Rug is 1 inch thick. "do you have the snow white shag in an 8x10 size?" "Is the grass green color rug true to picture? Lighter or darker?" "How many pounds is the 9 x 12 rug?" The weight is approximately 51 pounds. Looking for a rug to go under our bed on hardwood floors. Enticed by the sale price. Decided on shag and able to get the color I wanted. Price was irresistible. Am doing a bedroom in a new home in blue-and-white and needed an accent color. 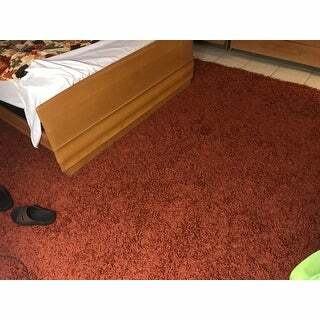 From the photo, this rug looks to be cushy underfoot and seems large enough to fit under the (queen-sized) bed with enough sticking out on each side. Hope so! Color options. Reviews. Value for money.